To get this shot, I held the Canon EF 8-15mm f/4 L USM Fisheye Lens just above the 1992 MasterCraft ProStar 190 ski boat's windshield. The circular fisheye field of view causes the lettering across the top of the windshield wrap nicely around the image border. I had my bother drive the boat toward the sunset while I shot handheld in this awkward position. The sunset and clouds of course provided lots of color reflections from the water, boat bow and windshield (and combinations of those). With a wide angle lens, get close to your subject. 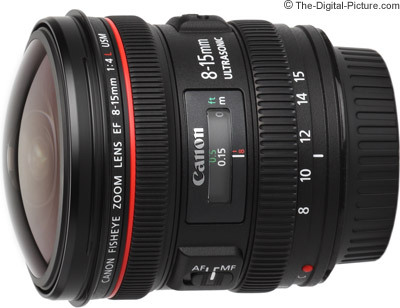 With the Canon EF 8-15mm f/4 L USM Fisheye Lens, get REALLY close to your subject. Well, you might want to be careful when honey bees are your subject, but this one did not mind my presence. This particular composition reasonably-well hides the fact that this is a full frame fisheye image. This is a 15mm full frame fisheye image taken with a full frame body. You can get this same look from the Canon EF 8-15mm f/4 L USM Fisheye Lens using a Canon APS-C or APS-H body by using a wider focal length. A saddled-horse stands near center-of-the-frame with its shadow running through the circular bottom edge of the frame while its rider adjusts a jump standard. Another horse and rider and a barn complement the composition by adding another layer of interest. If you can't keep yourself out of a circular fisheye image, become part of the composition. Clouds reflect from the water, boat bow and windshield in this sunset shot. Keeping a level horizon is very challenging when using a lens with barrel distortion. I obviously didn't attempt to do so in this image.